Natural beauty, historic homes, covered bridges and elegant shops lure visitors to Woodstock, Vermont year after year. Combine these attributes with nearby Vermont attractions - such as alpine skiing, cross country ski touring, romantic sleigh rides, biking, hiking, horseback riding, canoeing, golf, tennis, and basking in the sun at one of the many lakes in the region - and you've got a year-round destination for your babymoon vacation. The Village Inn of Woodstock is conveniently located in the heart of Woodstock village - just a short walk from numerous art galleries, wonderful shopping and dining, and all that central Vermont has to offer. The luxurious accommodations include a two-room suite and seven pampering guestrooms. Lodging amenities include a three-course gourmet breakfast, luxurious linens and gorgeous decor. 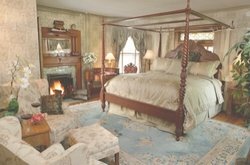 After a day of touring, relax and enjoy the guest tavern, seasonal gardens and front parlor and porch.